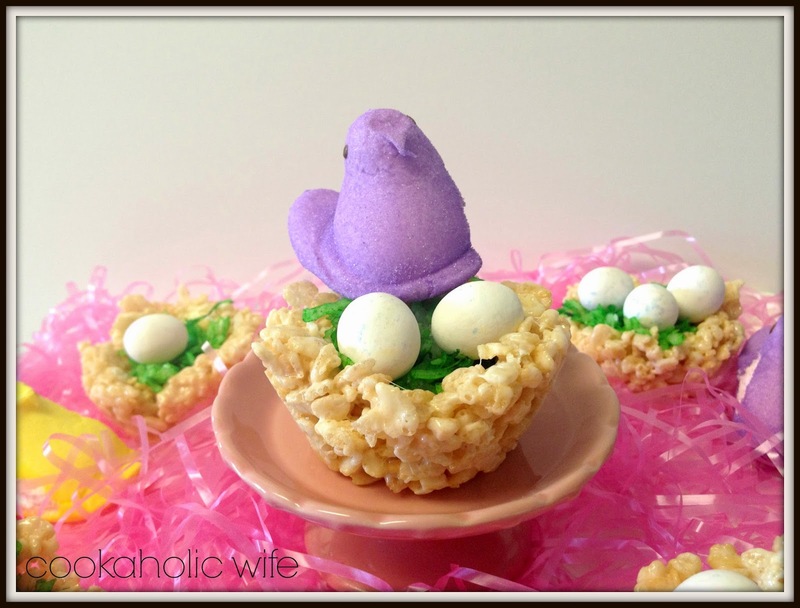 Easter recipes have been popping up on Pinterest since the beginning of March. As much as I try, I just can’t get into making recipes for holidays months in advance. I’d like to, since it would probably make things easier, but I just don’t see it ever happening. I did, however, start pinning those recipes back then and thinking about which ones I wanted to make and share with you before the actual holiday. These rice krispie treats were an instant pick. Everybody loves rice krispies, right? So why not add in some colored coconut and candy to make them even more delicious? And adorable. 1. Place the coconut in a zip-top bag. Add in food coloring and water. Seal the bag and toss around to coat the coconut and turn it green. 2. Melt the butter in a large saucepan over low heat. Add in the marshmallows and stir with a silicone spatula until fully melted. 3. Remove from the heat and stir in the rice krispies cereal until fully coated. 4. Quickly spray a muffin pan with non-stick cooking spray. Scoop the rice krispie mixture into each of the muffin wells and use the back of a rounded tablespoon to press down in the center of each. Work quickly as these cool fast. 5. Allow to cool completely, then remove from the pans. 6. 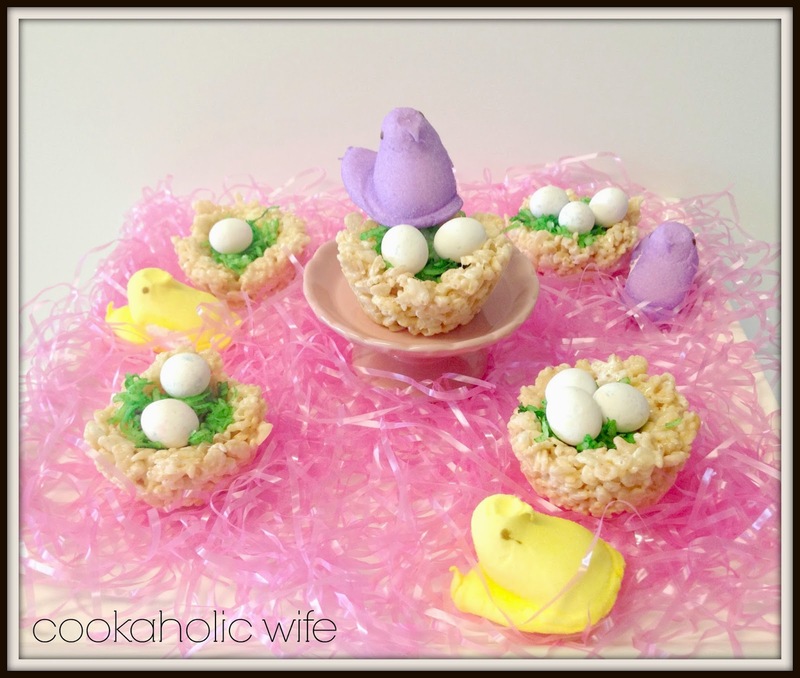 Add a heaping teaspoon of the colored coconut into each of the nests and top with your desired candies. Aren’t these adorable? The adorableness is killing me, I tell ya. These are so easy to make and something you could easily involve your kids in. And it sure doesn’t hurt that they’re extra tasty! 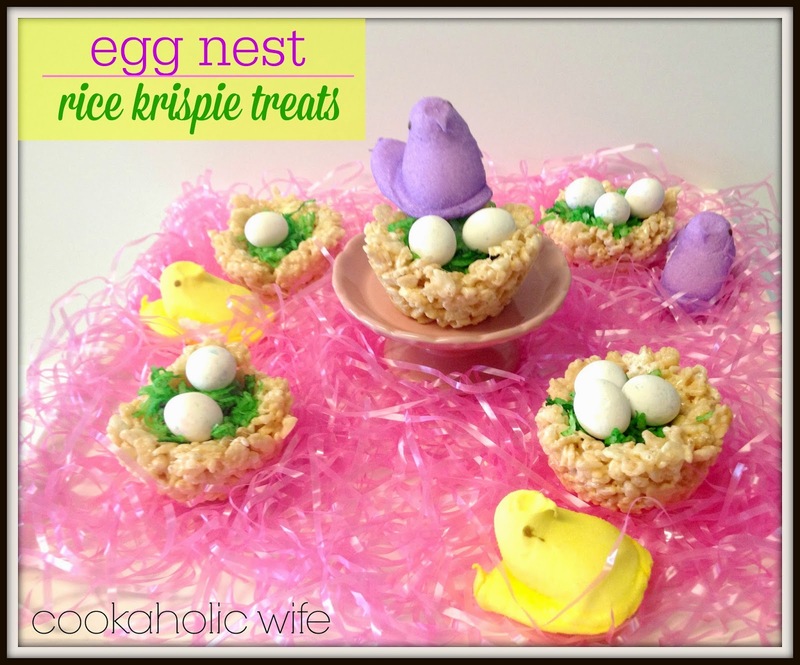 Your Rice Krispie Eggs Nest are just adorable! Thank you so much for sharing your special recipe with Full Plate Thursday. Hope you have a great week and come back soon!